After spending their first nine weeks working remotely and part-time, the first 18 students to enroll in Dev Bootcamp’s inaugural San Diego program for Web developers are moving downtown this week. 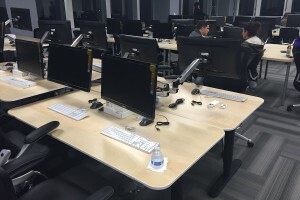 They begin the immersive phase of their vocational training today in “full-stack” Web development, with new equipment that Dev Bootcamp has installed in their newly remodeled office in a high-rise office building at 707 Broadway. Dev Bootcamp president Jon Stowe told me in a recent interview the nascent bootcamp industry continues to boom. The core appeal of “skills training for the new economy” still resonates with the cyber generation, he said, especially among those who can’t afford, or don’t want to go to college. Founded in 2012, the San Francisco-based coding school was acquired by Kaplan in 2014, and graduated 2,000 students last year from its programs in San Francisco, Chicago, and New York. San Diego became Dev Bootcamp’s fourth city in the fall, and Stowe said the school will launch Dev Bootcamp programs in Seattle; Austin, TX; and Washington, DC, by this summer. Stowe, who joined Dev Bootcamp near the end of 2013, said the bootcamp industry’s strong growth reflects the nationwide demand for Web developers, and he argued that vocational coding schools have become a source for qualified workers that is comparable to traditional college computer science programs. That said, not everyone going through these programs is hired right away. Course report finds that 27 percent of students had jobs within 30 days of graduation. By 120 days after graduation, nearly 89 percent found work in the field they trained for. A flood of entry-level programmers coming to the job market from these schools is also driving demand for advanced training offered by some programs. Course Report offers some guidance here for students who are trying to decide whether to pursue a computer science degree, or enroll in a coding bootcamp.